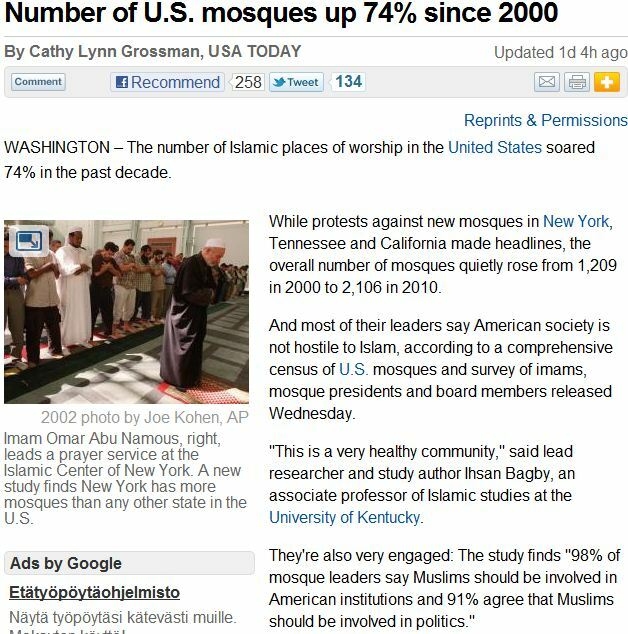 MOSQUE BUILDING IN U.S. EXPERIENCES BOOM SINCE 2000…….. – The Tundra Tabloids……. MOSQUE BUILDING IN U.S. EXPERIENCES BOOM SINCE 2000……..
Rise of the fifth column. And the overwhelming number of those are Wahabbi funded and/or influenced. Sounds like Mosque Busters could really be of some help and service in the New Country. Get into contact with the Law and Freedom Foundation. Previous Post Previous Post DR.MANFRED GERSTENFELD INTERVIEWS SIMON ERLANGER ON SWISS ANTI-SEMITISM……..
Next Post Next Post RED EYE’S GREG GUTFELD REMEMBERS HIS FRIEND ANDREW BREITBART……..